Combining luxury and charm, the Executive home elevator offers solid wood paneling and a range of fixtures to accentuate any home interior. 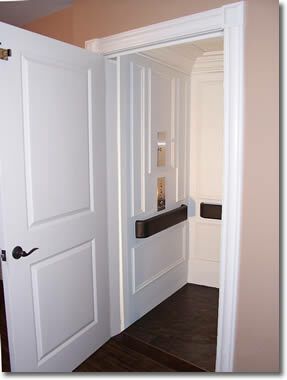 This residential elevator includes choices of raised or recessed paneling, panel layout, and a wide variety of wood types. The rich bold texture of wood grain evokes a sense of natural beauty to compliment your home.